I recently purchased a Santoku knife to use as a daily general purpose knife. If you know who I am, I often take a lot of time to research purchases like this, especially as I do want these things to last a long time. Originally, my plan was to get a chef's knife. The main difference between the two is the motion of the chopping. A chef's knife is best used in a rocking motion due to its curved cutting edge, while a Santoku has a flatter edge and should be used with a chop-chop, up-down motion. I realized I could not be entirely sure of what I wanted between the two until I had them in my hands, so I went into a local knife store to try them out. I asked many questions, including information about storing them and how the knives compared across the brands. I finally decided on a cheaper Victorinox Santoku because it was a knife from a solid company and with good reviews for this particular knife. After paying, the person helping me asked, "Are you in the industry?" I laughed, as it seemed my research into knives made me look more seasoned than I actually am. If she saw me actually work in the kitchen, she probably would take that question back. Clearly, anyone can look really good with research and informed questions, but what makes it stand out as actually professional is their performance. When it comes to products, this is a very similar story, as specifications on sheets can only speak so much in comparison to their actual functionality. How does the Cooler Master MasterLiquid ML120R RGB perform today, and is it a capable cooler? Let us read on to find out! 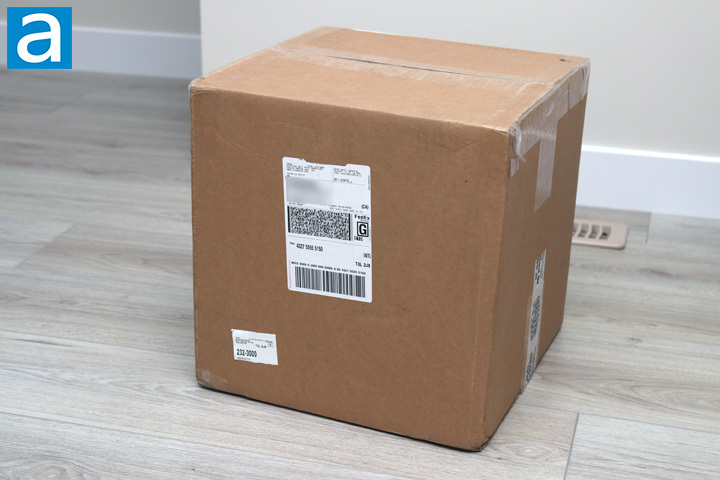 Today's review unit of the Cooler Master MasterLiquid ML120R RGB arrived in a large brown corrugated cardboard box. This came from Cooler Master's offices in Chino, California, travelling with FedEx and their standard ground service. All the edges were sealed with either a clear packing tape or a marked Cooler Master packing seal. There were no bumps or bruises to be concerned about, as the box arrived in relatively good condition. Inside the box, we have both the MasterLiquid ML120R RGB I will be looking at today, as well as the 240mm version that I have covered. There are also some air pockets to prevent any damage to the contents. 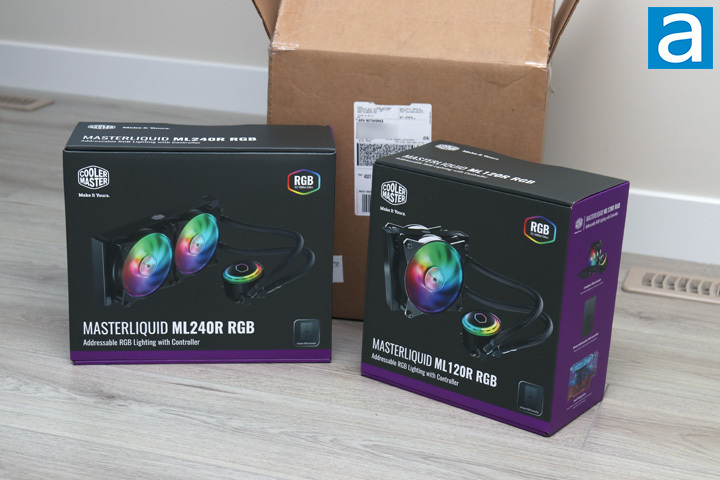 As you can see, both the MasterLiquid ML120R RGB and ML240R RGB came to us in a standard Cooler Master affair. Following their purple and black theme, both of these boxes are clean in design and shows off the product on the front. They also both feature addressable RGB. or ARGB, lighting with an included RGB controller. ARGB is something that can be referred to as a refined version of RGB. While you may not necessarily associated refinement with rainbow flashy lights, ARGB is refined in the sense that users can control each LED in terms of color and brightness. We will see how this translates to real usage later on. 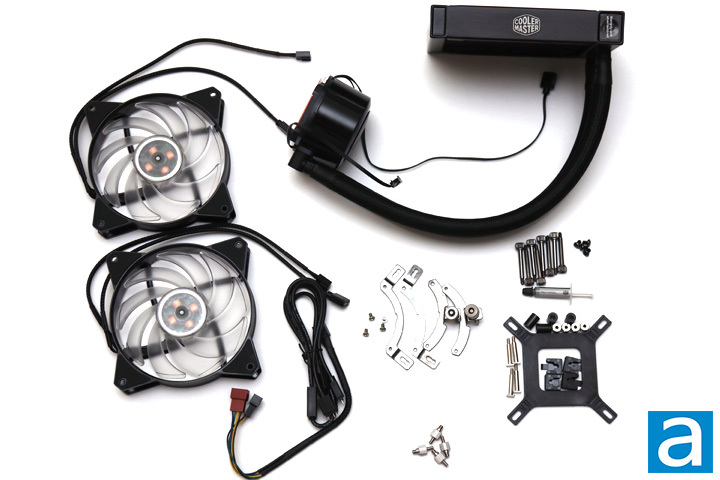 Out of the box, the Cooler Master MasterLiquid ML120R RGB comes with all of the typical accessories you would get with an all-in-one liquid cooler. All the mounting accessories are included to mount this onto the common consumer Intel and AMD sockets. This includes Intel's LGA2066, LGA2011, LGA1366, LGA115x, LGA775 sockets, and AMD's FM1, FM2/+, AM2/+, AM3/+ and AM4. The AMD TR4 socket is not supported due to its much larger size. RGB accessories are also present, though not pictured, including the light controller and all of its wires. Interestingly, Cooler Master included two fans with this cooler, despite it being a smaller size. This means you can put fans on both sides of the radiator for some push-pull action. Otherwise, there is some documentation and warranty information for the ML120R RGB. Just like the MasterLiquid ML240R RGB, Cooler Master only backs their AIO coolers for only two years, which is much shorter than some AIO coolers.